Goodie Bag Tops have a front and back, similar to candy bar wrappers. Our tops are 7 1/2" wide and can be used with resealable sandwich/snack bags or any party bag. 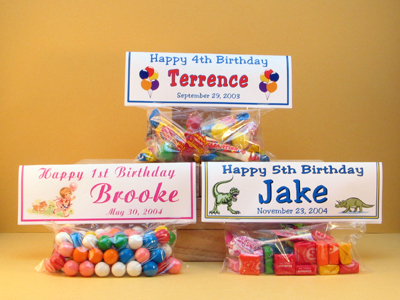 Party Wraps Goodie Bag Tops are made with laminated photo quality card stock. Just fill the your bags with your items, close, and then staple.......It's that simple! You can fill your Goodie Bag Favor with candy, trading cards, baby items, small toys, business samples, and any other miscellaneous items you can think of. Personalize the goodie bag top however you would like, specify your personalizations in the instruction boxes on this order form.